The accused told gardaí, “Sorry for his loss, if that means anything” when he was charged. Photo of the scene where Douglas's body was found in July 2016. A 24-YEAR-OLD man has been charged with the murder of David ‘Daithi’ Douglas who was shot dead in Dublin two years ago. Gareth Brophy, who is currently of no fixed abode but from Dublin’s south inner city, told gardaí, “Sorry for his loss, if that means anything” when he was charged. 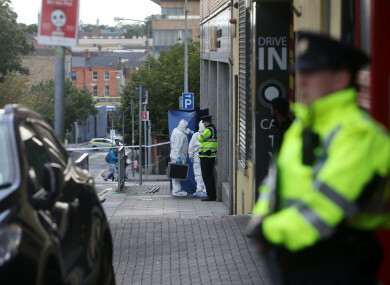 Douglas, 55, from Killala Road, in Cabra in north Dublin was fatally wounded in a shooting outside his wife’s shop on Bridgefoot Street in Dublin on afternoon of 1 July 2016. He was the ninth person to die in the Hutch-Kinahan feud. Brophy was remanded in custody after he appeared before Judge Dermot Simms at Dublin District Court this morning charged with the murder of Mr Douglas. Evidence was given by Detective Garda Nall Godfrey. He told the court the accused was arrested at the Barn House public house in Dolphins Barn, Dublin 8 at 11.58pm on Sunday. He was taken to Kevin Street station and charged there at 2.54am today. Detective Garda Godfrey said he cautioned Brophy that he did not have to say anything and anything he did say may be given in evidence. In reply to the charge, Mr Brophy said, “Sorry for his loss if that means anything”, Detective Garda Godfrey said. The court heard the Director of Public Prosecutions has directed the accused was to be returned for trial and he could also be sent forward for sentence on a signed plea should that arise. Defence solicitor Jenny McGeever furnished the court with a statement of her client’s means. Noting there was no Garda objection, Judge Simms granted legal aid and remanded the accused in custody to appear at Cloverhill District Court on Friday. Dressed in a grey hooded jumper, blue jeans and black runners, Mr Brophy stood smiling with his arms folded throughout the brief hearing. During the proceedings he spoke quietly to his legal team but has not yet indicated how he will plead. Email “Man, 24, charged with 2016 feud murder of Daithi Douglas”. Feedback on “Man, 24, charged with 2016 feud murder of Daithi Douglas”.